Pasadena Black Lives Matter chapter leader Jasmine "Abdullah" Richards was just wrongfully convicted of "felony lynching," and faces up to four years in prison. This takes the targeting of BLM leaders to a whole new level. On Tuesday, June 7, Judge Elaine Lu will determine Richards' sentencing. As Asian Americans and Pacific Islanders, we need to make sure Judge Lu hears our demand to #FreeJasmine and stop the political persecution of Black Lives Matter activists. Tell Judge Lu: AAPIs back the calls of ColorofChange.org and Black Lives Matter International Network and demand no jail time for Jasmine Richards. Jasmine was arrested and charged for "lynching" last September after she attempted to shield a Black woman from what she deemed to be an unlawful detainment by Pasadena police after a Peace March she and the chapter organized. Although the peaceful march was made up of twenty-some children, mothers, and community members, the prosecutor claimed it was a "riot" in order to pursue the "lynching" charge. The charge comes from the twisted misapplication of a 1933 California law created to stop lynch mobs from forcibly removing detainees from police custody and engaging in public murders of Black people. To convict Jasmine of "attempted lynching" is a willful misinterpretation of a law created to protect Black lives. There were no Black people on the jury that convicted Jasmine. 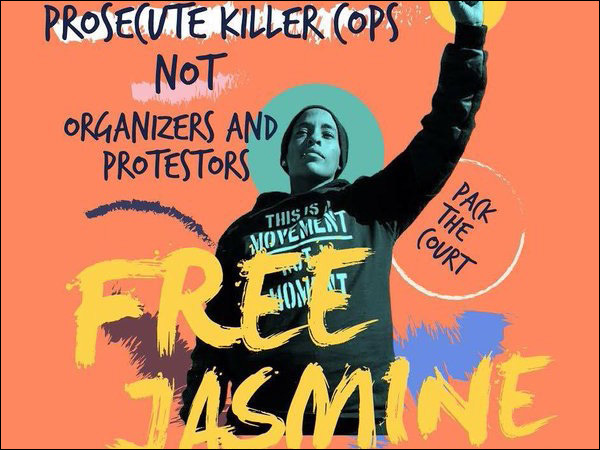 Los Angeles BLM chapter organizer Melina Abdullah stressed that Jasmine was targeted for her political activity and leadership in Pasadena: "Jasmine is a political prisoner and represents probably the hugest threat to the state, in that the folks at the bottom can recognize their own oppression and rise up against it." As AAPIs committed to racial justice for all, we know our liberation is tied to the liberation of Black communities. From Ferguson to Baltimore to Staten Island, we've been showing up to demand an end to state violence and the crisis of police brutality that impacts all of us, but which disproportionately targets Black communities. That's why we're coming together with our partners at ColorOfChange.org to call on Judge Lu to see to it that Jasmine Richards receives no jail time for the ludicrous conviction of "attempted lynching." Sign the letter to tell Judge Lu that AAPIs demand no jail time for BLM leader Jasmine Richards. This post was originally published at 18 Million Rising. Sign the petition here.